NASA just presented a fascinating, but rational,clarification for one of the latest space mysteries to date—Pluto’s moving mountains. Pluto’s complex land contains a hill cluster situated in the main ice plain that was formerly called the Sputnik Planum, at the “heart” of Pluto. The hills differ in size, from one to 12 km/miles wide, and are mainly reflected as proof of Pluto’s multifaceted geology. But what’s even more exciting is that hills, unlike the hills found on earth, are not stationary. So what is NASA’s explanation for these moving hills? These hills that were spotted based on New Horizon’s newest mission data, are essentially icebergs. This clarification makes a lot of sense—excluding the surface that these ice hills are moving on is also apparently on ice. So how does ice float on ice? Ice-on-ice movement is a concept that NASA’s New Horizon’s team has been working on for a little over a month. 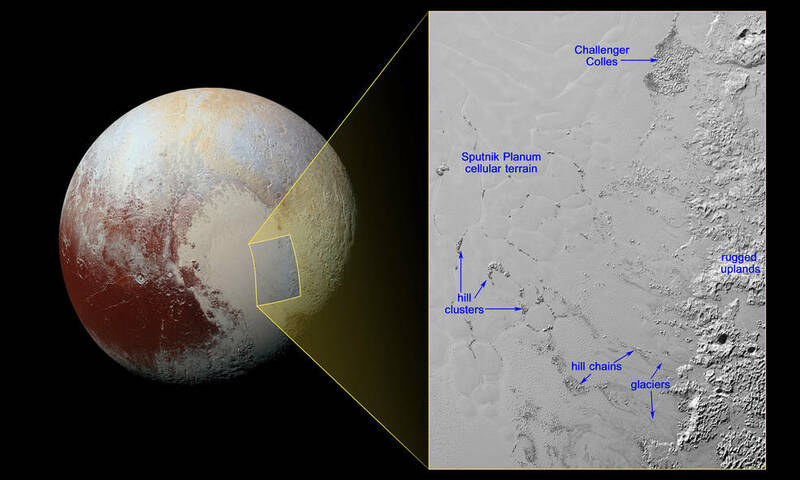 The theory suggests that we are essentially seeing two different kinds of ice—nitrogen ice that is quite common on the Pluto and the other is water ice. Nitrogen ice is considerably denser than water ice, which then permits the ice hills movement as it “floats” on. Think of it in kind of the similar way icebergs travel across the Arctic Ocean. So what’s next for the scientists now that one of Pluto’s extreme geological puzzles has been cracked? NASA has declared that New Horizons will look into finding out how and why piles of nitrogen are moving down the dwarf planet’s surface.